The Santa Monica Police Department needs your assistance in identifying and locating a vehicle involved in a felony Hit and Run traffic Collision on Wilshire Blvd. east of Lincoln Blvd. On May 6, 2010 at 5:05 p.m., the suspect vehicle rear-ended a second vehicle causing minor injury to the occupants and moderate damage to the victim’s vehicle. The driver exited the vehicle, examined the damage, and then fled from the scene. 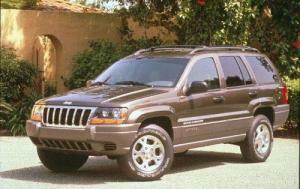 The initial investigation revealed that the vehicle is described as a 1999 Jeep Grand Cherokee Laredo SUV, black in color with license number 4HDC395 (CA). The driver was described as a female, white, 25 to 32 years old, 5’05” tall, 120 pounds, blond hair in a pony tail, thin build, wearing shorts. Witnesses can identify the driver by sight. Anyone with information is asked to contact Investigator Chris Dawson (310) 458-8954 or Sergeant Wiles (310) 458-8950, Sergeant Trisler (310) 458-8471, or the Santa Monica Police Department (24 hours) (310) 458-8495.